Ben Redwine is a rare individual who performs jazz and classical music equally. He is the leader and regular member of many ensembles including the ones below. Please contact us to discuss which of the ensembles below will be perfect for your special event! The Redwine Jazz Band's goal is the promotion, perpetuation, and performance of traditional jazz---America's only indigenous art form. 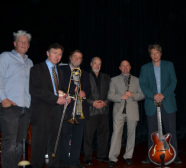 The Redwine Jazz Band performs "popular" music from the early part of the twentieth century. The band can consist of between two and seven musicians. 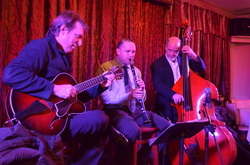 The core of the band includes clarinetist Ben Redwine, guitarist Tom Mitchell, and bassist John Previti. They will be perfect for your next event! Born out of research stemming from Ben's doctoral minor, Latin American music history, the Samba Jazz Project initially paid homage to the famous 1962 recording "Jazz Samba" featuring Charlie Byrd, Stan Getz, and Keter Betts. The group recorded their debut album in 2012 (the 50th anniversary of the famous recording) on the same stage in Washingtion, DC, Pierce Hall at All Souls Unitarian Church as the original recording. The Dirty Rice Jazz Band plays New Orleans style traditional jazz, and music from such masters as Duke Ellington and George Gershwin. The band can be as small as two players, or as large as seven players. Why travel to New Orleans for Mardi Gras when Mardi Gras can come to you? The band is high energy; your guests will be "dancing in the aisles"! Ben is an accomplished classical musician. 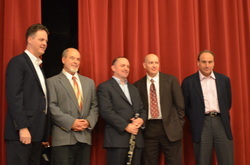 He has managed the DC Chamber Society Chamber Music ensemble since 1999. They perform standard repertoire from the classical chamber music genre, as well as champion new works. Ben and his ensemble have premiered over 30 new compositions since the group's inception. They have performed at the Kennedy Center, the Smithsonian, and many other prestigious venues in the Washington, DC region. Ben's next project is to record the music of Django Reinhardt and his gypsy jazz! Contact Ben to pre-order his next CD-Le Chat Noir. Ben's idol is Artie Shaw. Audiences compare his performances to Artie Shaw, Benny Goodman, Jimmy Giuffre, and Buddy DeFranco. He also has studied and is a huge fan of the following jazz masters from history: Stan Getz, Duke Ellington, Paul Desmond, Louis Armstrong, Art Pepper, Django Reinhardt, Wynton Marsalis, Jack Teagarden, Charles Mingus, Gerry Mulligan, Milt Hinton, Keter Betts, Charlie Byrd, Joe Byrd, Gene Byrd, Howard Alden, Ken Peplowski, George Gershwin, Jerome Kern, Cole Porter, Hoagy Carmichael, Paul Barbarin, and many, many more!! !